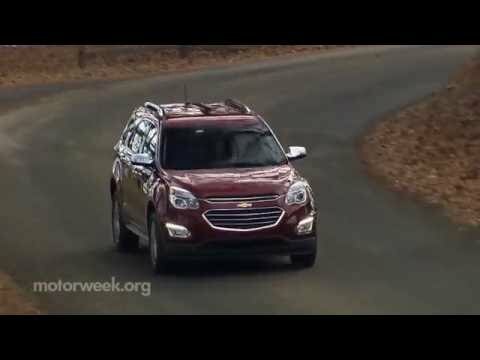 Bigger than compact SUVs like the Honda CR-V, but smaller than a midsize like the Ford Edge, the 2016 Chevrolet Equinox is a compromise. This 'tweener crossover SUV offers a good-sized rear seat and V6 power, but with less cargo space than a full midsize. The car has very many wonderful features. It is very comfortable for me to get into as I am short and have arthritis issues. The vehicle gets great gas mileage averaging around 25 miles to the gallon. The back up camera is awesome. The few issues I have with it. I wish that the back seat folded down flat or flush with the floor instead of being at an angle. I wish that the horn was thumb activated instead of it being the center of the steering wheel. I have had some electrical things popping up like the low fuel indicator is not working, sometimes the air temperature is 20 or 30 degrees off from actual temp and sometimes the back up camera doesn't shut off after the car goes into drive which is very distracting seeing everything behind you when you are going forward. Special features on the Chevy Equinox. Seats 5 comfortably. Rear seat adjusts for more leg room or more cargo room. Has cruise control, an eco setting to save gas. An manual setting for controlling you speed on hills. It has collision sensors on the front with a backup camera with alerts to objects behind you or coming from the sides it has a signal if you go out of your lane. Has a lift gate which is automatic with three ways to activate it. With your key fob, with a button on the lift gate itself or with the button in the front. You also can adjust how far it raises. Has navigation on the dash. Has on star and with the app can do many thing. Turn on the engine open or lock the doors. Send a destination to navigation. Check the health of your vehicle. Check how you drive. And many other features. Comfortable and roomy for family traveling. Car is very dependable. I have had no maintenance issues except for a solenoid that was covered by the factory warranty. Has roomy seating and comfortable on long trips. Took it on two trips that were over a thousand miles and it ran great. Gas mileage is not great because I live on back country road with a lot of twists and turns. If you live in a city it would do great though. I have had to change the oil once in the past 6 months since I have had it. Never had to put more oil or antifreeze in it. There are 5 of us so it comfortably seats us all without my kids having to be on top of one another. The seats adjust perfectly because I am a short person. I do not like the ac because it i'd either too much or not enough there is no in-between. General Motors LLC (GM) is recalling certain model year 2016 Chevrolet Equinox and GMC Terrain vehicles manufactured October 16, 2015. The certification labels may have incorrect tire/rim size and cold tire pressure information. As such, these vehicles fail to comply with the requirements of Federal Motor Vehicle Safety Standard (FMVSS) number 110, "Tire Selection and Rims." If the information on the certification labels is incorrect, the operator may install incorrectly sized tires or rims or may improperly inflate the tires, increasing the risk of a crash. GM will notify owners, and dealers will inspect and replace the certification label, free of charge. The manufacturer has not yet provided a notification schedule. Owners may contact Chevrolet customer service at 1-800-222-1050, or GMC customer service at 1-800-462-8782. GM's number for this recall is 46600.